I am a huge fan of the Albariño grape grown mostly in the Rais Baixas region of Spain. This is a grape that expresses very interesting tropical fruit qualities that I just adore. 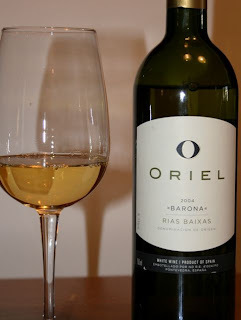 When I saw this Oriel 2004 Albariño in my local shop for $11 I had to pick it up. The wine had a delightful golden color and the nose did not disappoint. It had aromas of pear, pineapple, mango, papaya and all the things I usually associate with this grape. Aromatically it was quite interesting. It fell flat on the palate, however, in a big way. Oh, it had a nice acidity and flavors of pineapples and honey for days. There were hints of apricot and lemon (as in lemon pledge furniture polish). It was very light and overall not as interesting as I expected. I would give this one an 85 if I were to score it.